Why have a Master Reset? Every ReachOut account comes preloaded with test data: sample Customers, Inspections, Work Orders, Tickets and Forms so that you can take it for a test drive immediately after you sign up. You can work with these preloaded items, or add new items to learn and experiment. Once you’re ready to “go live” with ReachOut, you use the Master Reset to instantly clear all these items from your system. 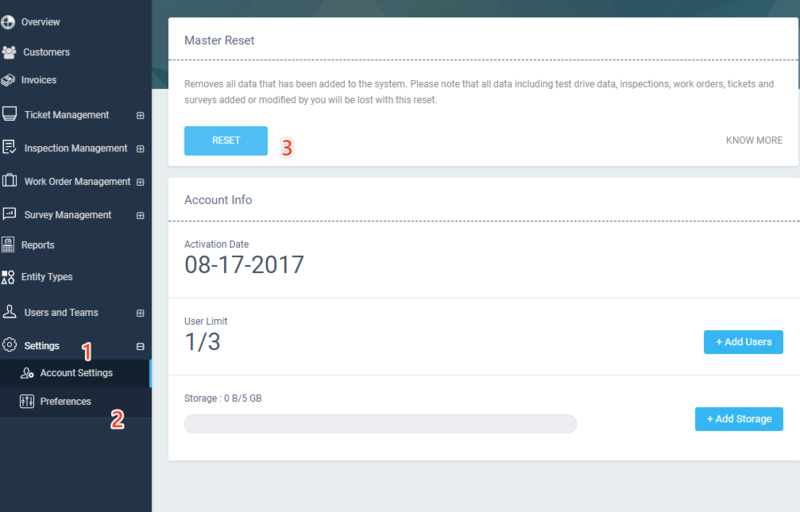 Master Reset saves you the trouble of having to go to every page to delete inspections, work orders, pictures, tickets etc. one by one. But be warned: deleted data cannot be restored. Note, however, the current Users and Preferences will not be affected by the Master Reset process. Did you delete the sample data by accident, or do you simply want to restart with the original trial data we provided? We have you covered. You can always import the sample data again using the Import button. To know more about managing Users, click here. To know more about managing Preferences, click here.